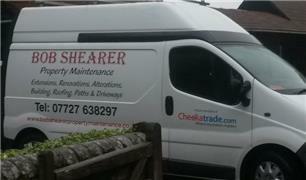 Bob Shearer Property Maintenance, Building & Roofing - Builder, Roofer based in Andover, Hampshire. My name is Bob Shearer and i have over 40 years experience within the building industry. I am a sole trader who undertakes all aspects of the trade hence the reason why i started Bob Shearer Property Maintenance, Building & Roofing. I know and understand the good old English weather and the damage it can do, so i also undertake insurance claims too.